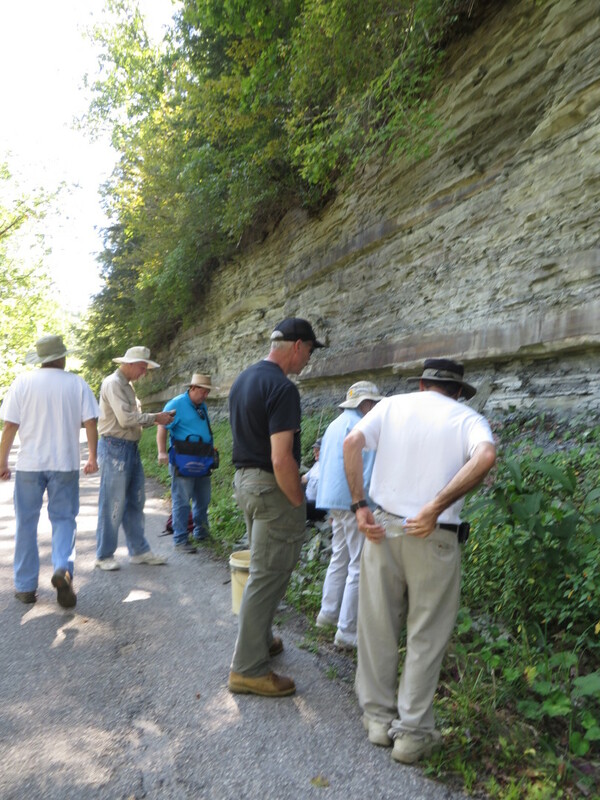 Dry Dredgers field trip chair, Bob Bross, was invited by a land owner in Greenup County, Kentucky to come out with a group of knowledgeable Dry Dredgers to help identify the fossils found on the property and to determine the stratigraphy exposed on the land. 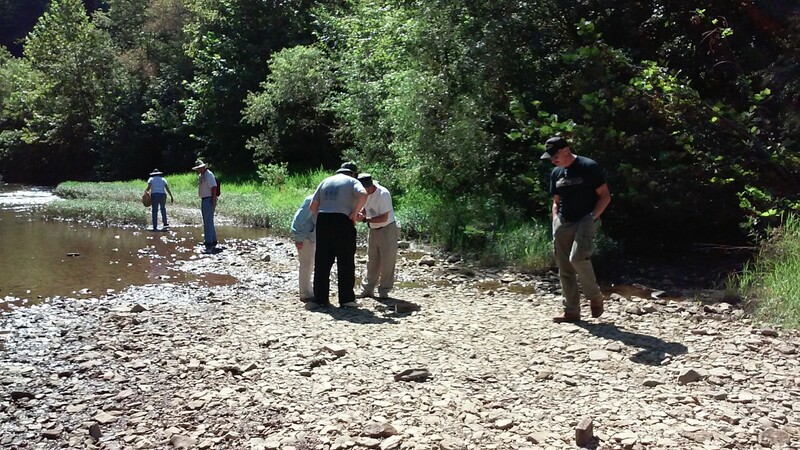 Site #1 was a creek and consisted of a mix of rock types and fossils transported by water from upstream and from the nearby hills. The walls of the creek were mostly dirt and had no rock exposure that we could see. 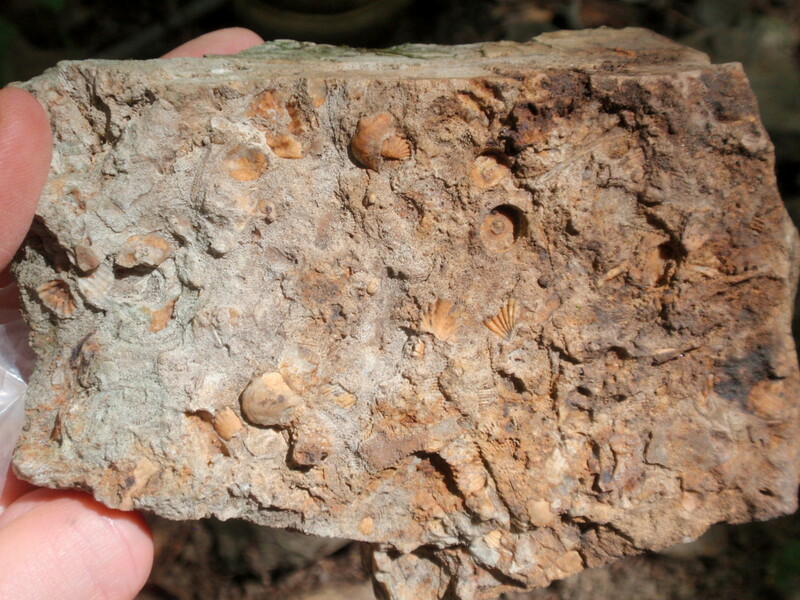 In the bed, we found mostly marine invertebrate fossils of the Mississippian Period (brachiopods and bryozoans) but saw small signs of coal and Pennsylvanian Period plant fossils. 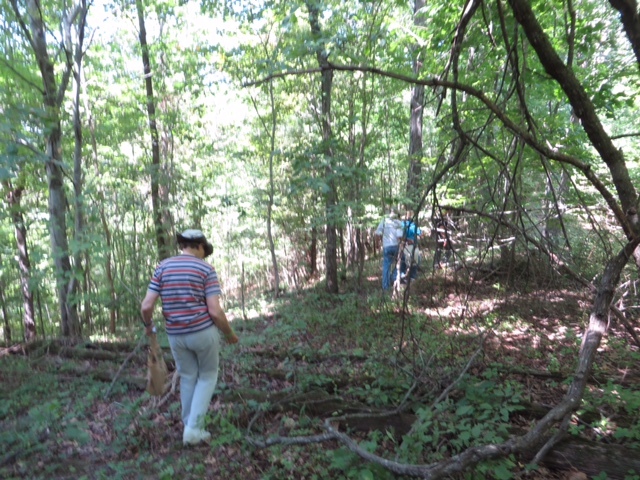 Site#2 was a road cut along a small road that runs along the creek. 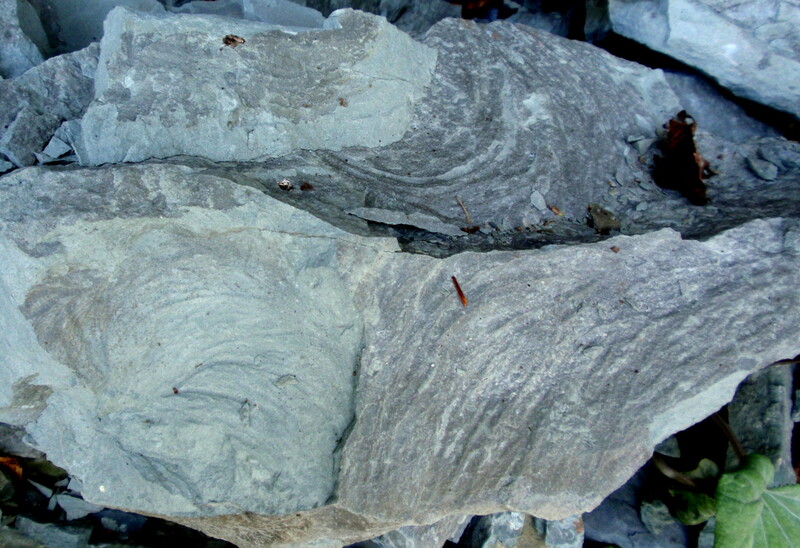 It exposed thick layers of soft and flakey shale loaded with trace fossils interleaved with hard layers of siltstone and sandstone, which appear to contain no fossils. The age of this site is early Mississippian Period (roughly 358.9 to 323.2 million years old). Site #3 was along the high point of a ridge to the east of the other two sites. 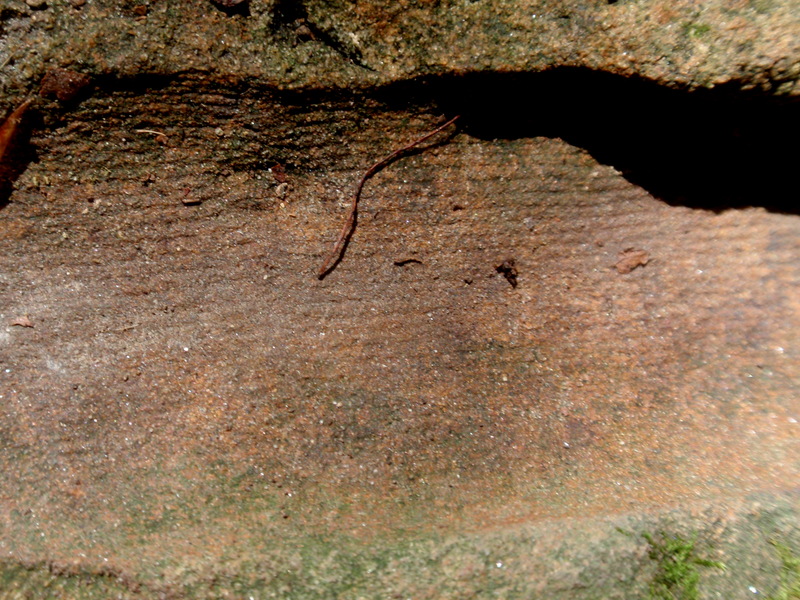 Here only small patchy exposures of sandstone were found that held plant fossils of Pensylvanian age (roughly 323.2 to 298.9 million years old). From this KGS data, we can see the age of the rocks and fossils from the creek bed on up to the top of the ridge in the cross-section below. This stratigraphic mapping allows us to identify the various fossils found on the farm based on the flora and fauna alive during those periods in natural history. At the Site#1, the creek bed was full of varying rock types but the ones with fossils that we recognized were in red to light brown chert or marl with fossil marine invertebrate casts and molds on the rock surfaces. These marine animals lived during the early Mississippian Period, mostly attached to the sea bottom. 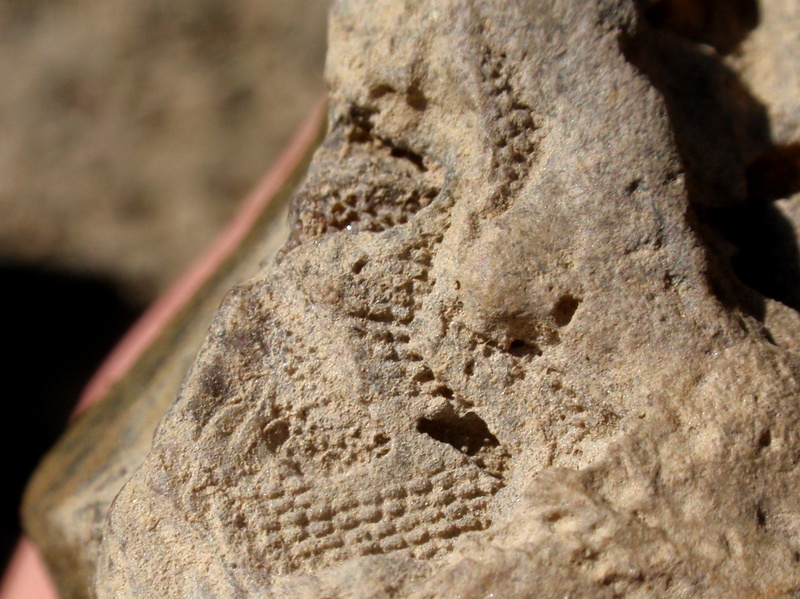 The first fossils we noticed at site#1 were abundant Fenestrate Bryozoans. 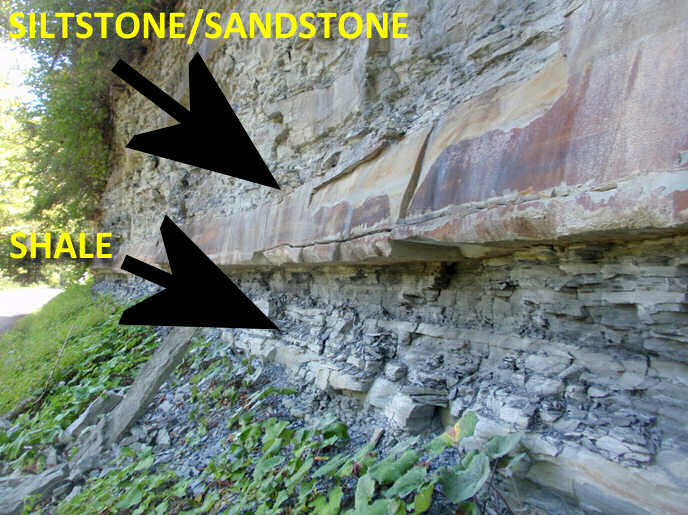 As shown in the photos below, these are molds or negative impressions in the chert. The original animals formed colonies sharing a hard shell that did preserve as calcareous fossils but did not survive the test of time. 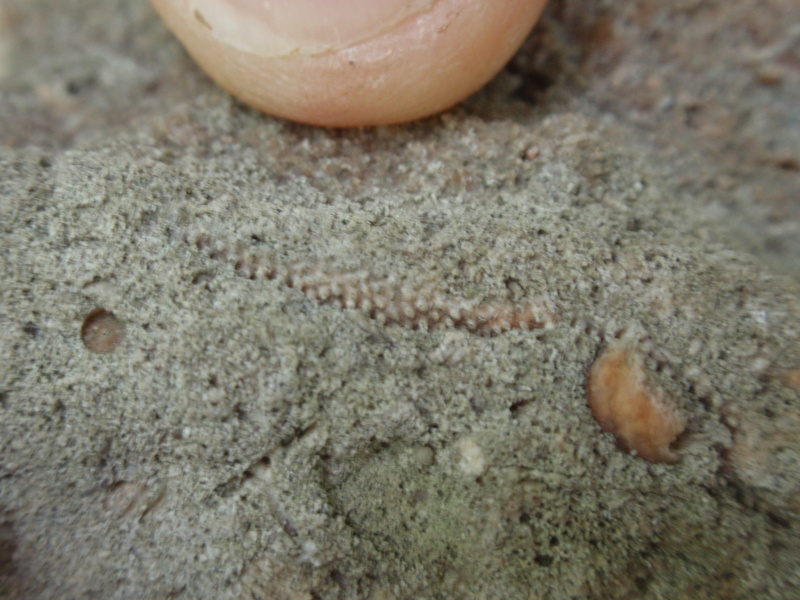 The above Fenestrate Bryozoans are probably Cystodictya sp. (Ulrich, 1882.). 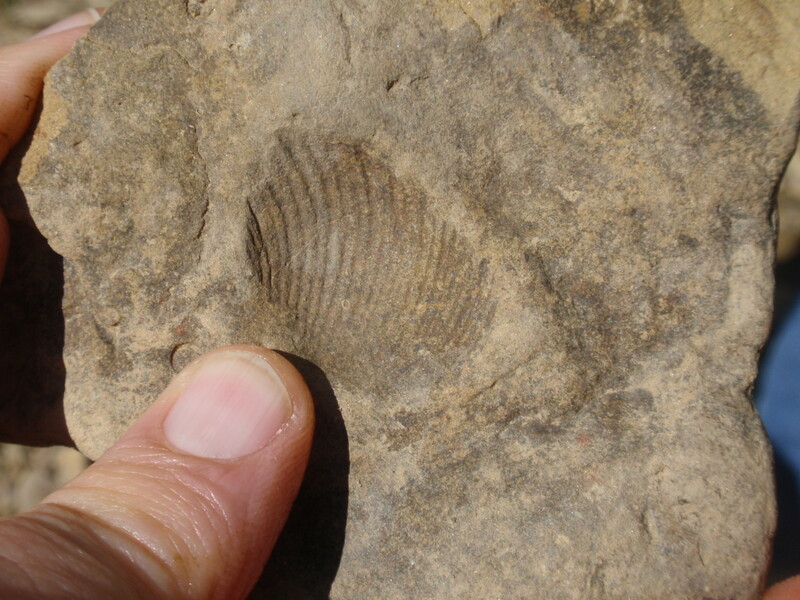 We also found evidence of clams and brachiopods in the negative impressions of the creek bed rocks. 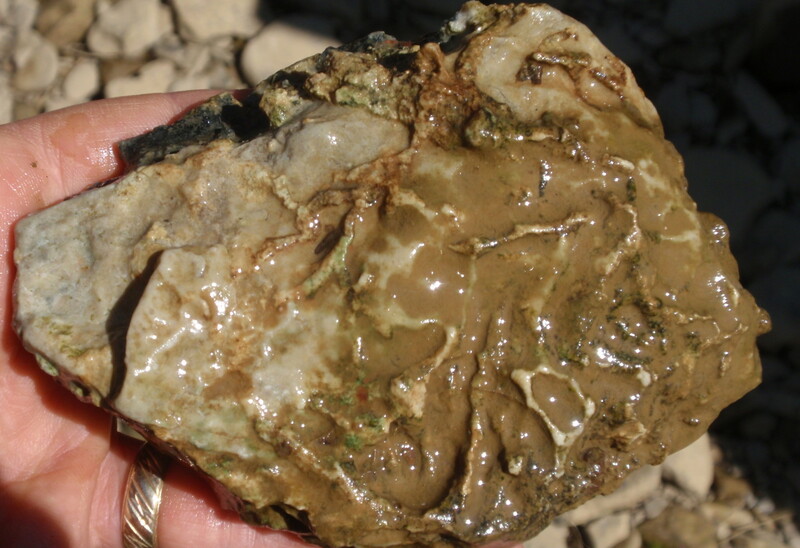 The one below appears to be a bivalve (clam) which lived in the mud below the bryozoans. 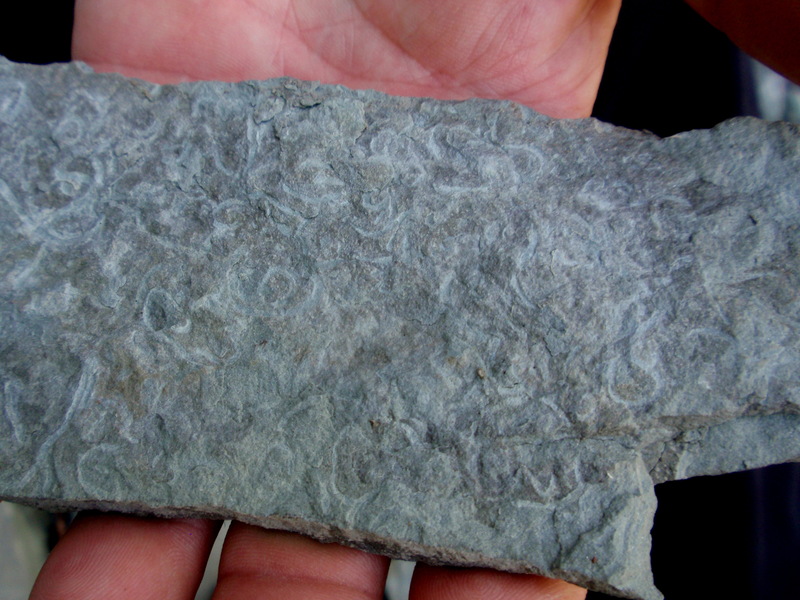 We also found an abundance of trace fossils in shale. 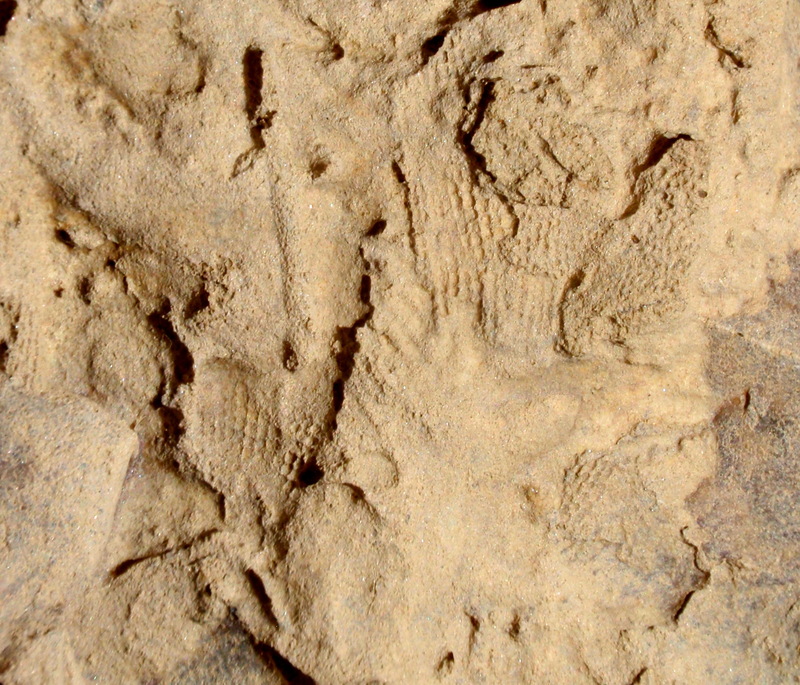 These are of early Mississippian age (323 to 360 million years old) made by mostly worms burrowing in the mud on the sea bottom. 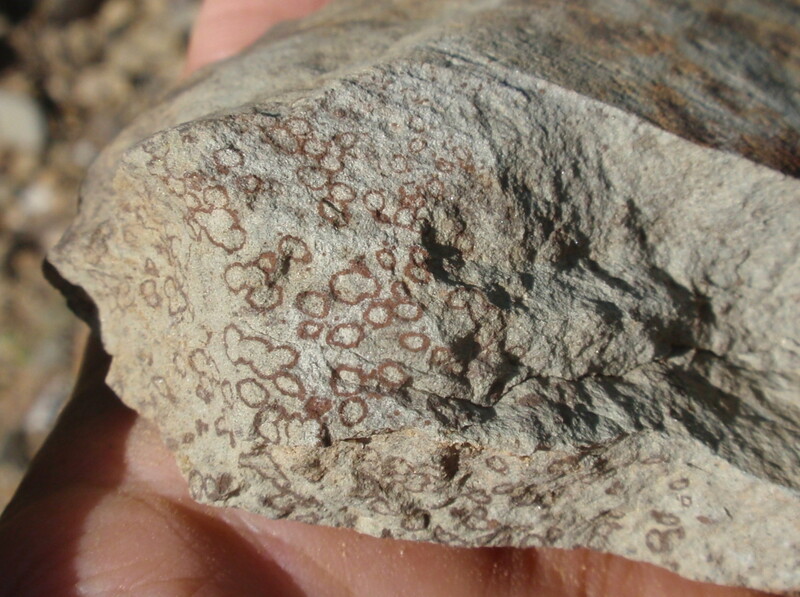 We found this one interesting trace fossil (below) in which the burrows were lined with iron oxide or other brown mineral making them each appear as circles. 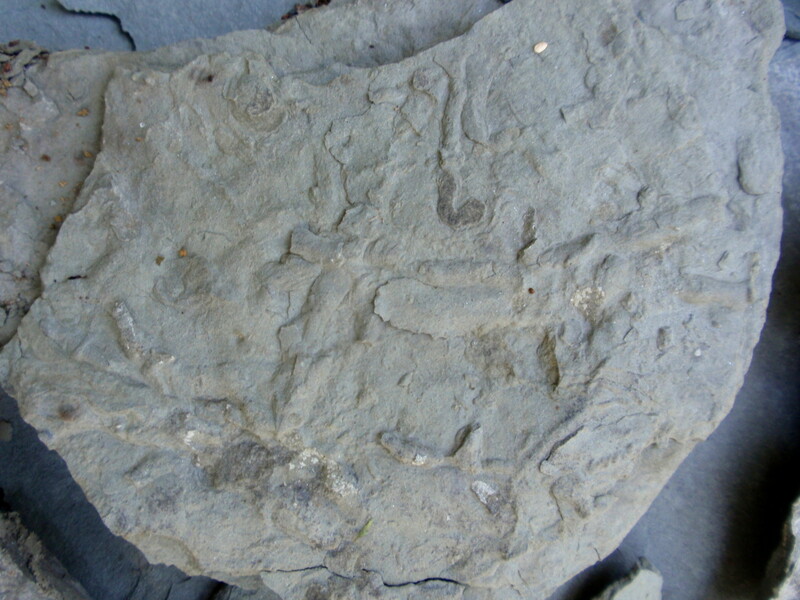 The creek bed also produced examples of petrified wood of what was probably Calamites, a type of horsetail plant. 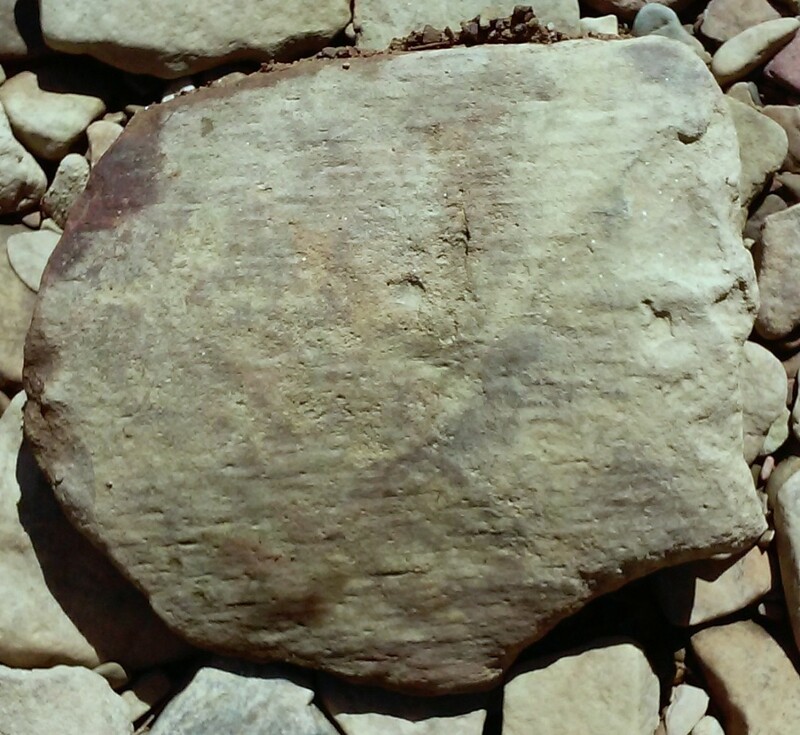 This is likely to have come from upstream and represents a more recent period – The Pennsylvanian Period 323 to 300 million years ago (2 pictures below). 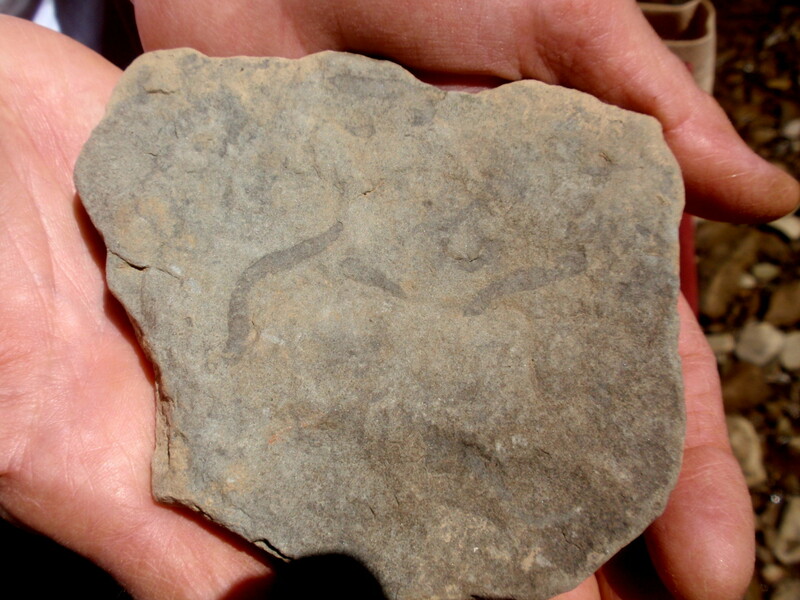 Here are photos of some of the trace fossils we found on this road cut. 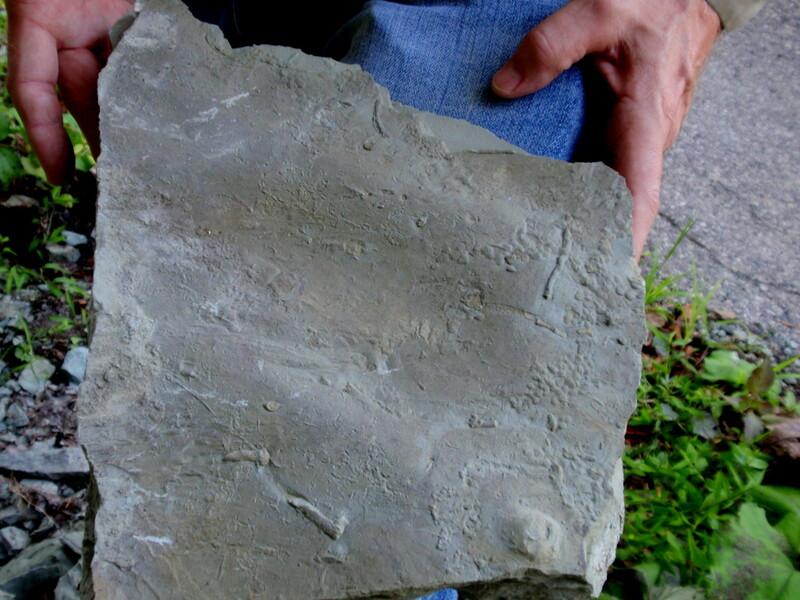 In the last photo above, in addition to trace fossils you can see the waves of the sea floor. 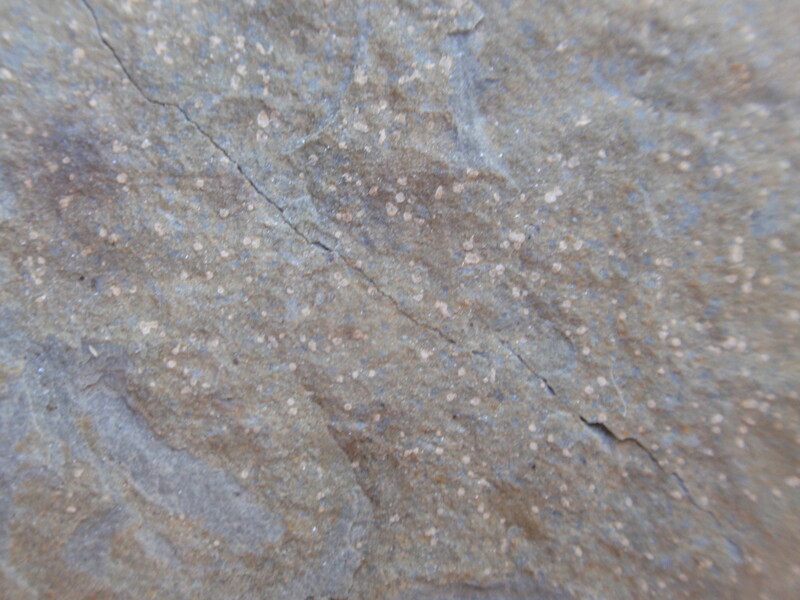 The hard siltstone layers at the road cut were mostly devoid of fossils, but we found some interesting tiny crystal formations happening (white dots on photo below) that may be nothing but these could be microfossils. 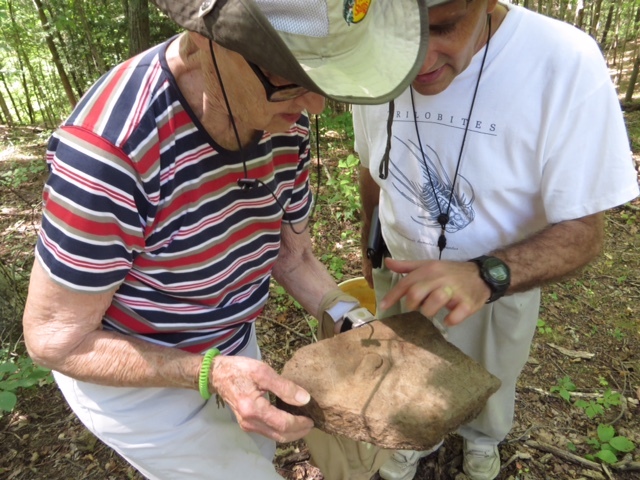 When we proceeded up the ridge (site#3) to the east of the other two fossil sites, we were all very happy to find plant fossils. 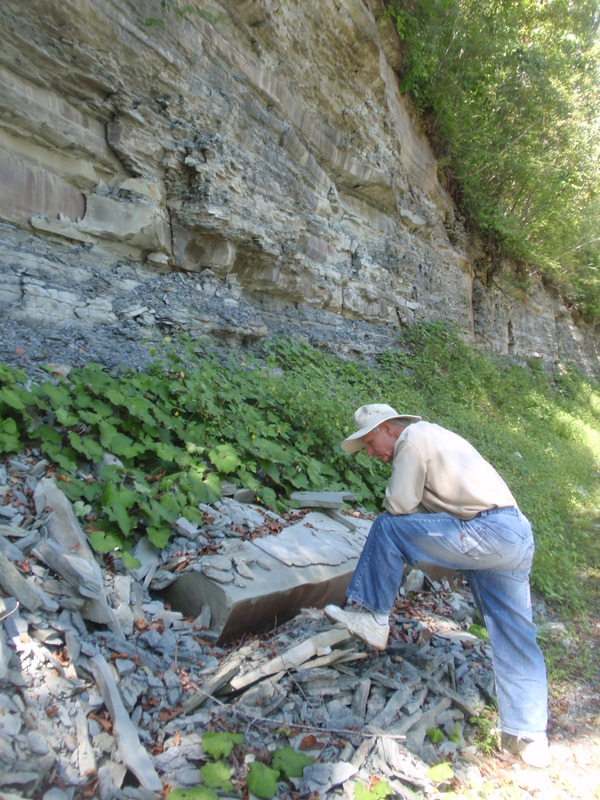 Where we come from (Cincinnati, Ohio) the only plant fossils we find are algae and those of dubious affinity. 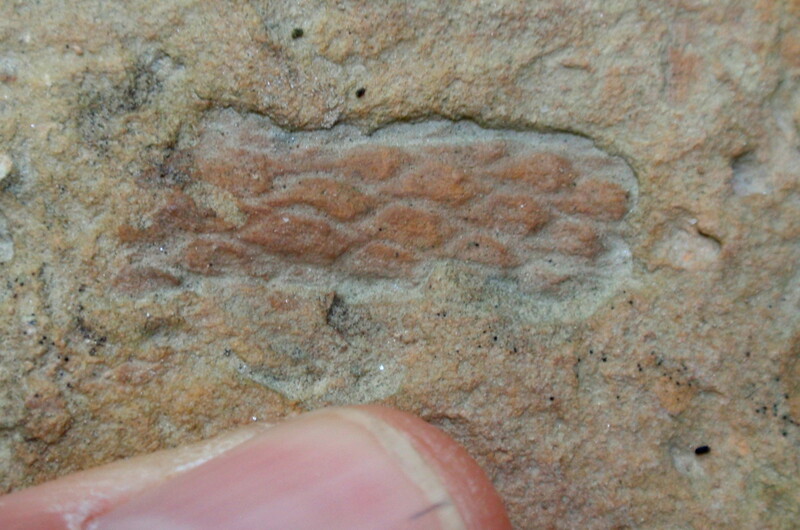 The first thing we saw is the (above) fossil peeking through the rock with the very distinct and unmistakable pattern of the bark on a “horsetail” stalk, generally referred to as Calamites but may be more closely identified as Sigillaria sp.. 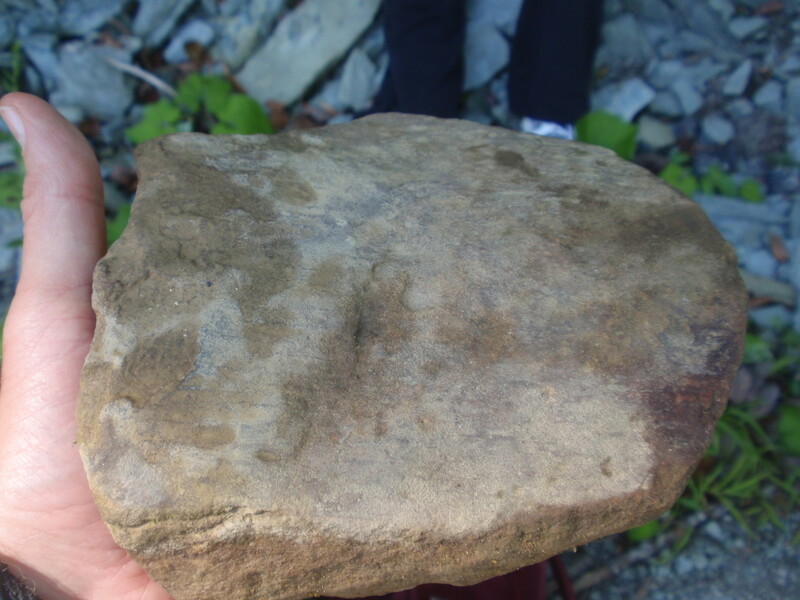 This confirms that the plant fossils we found in the creek came from the rock layers up on the ridge. 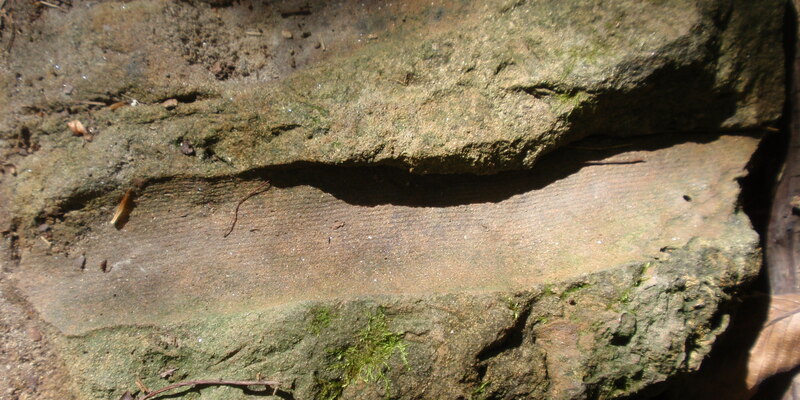 Then we found a great fossil – a lower trunk segment of one of these “horsetails” – probably Calamites. 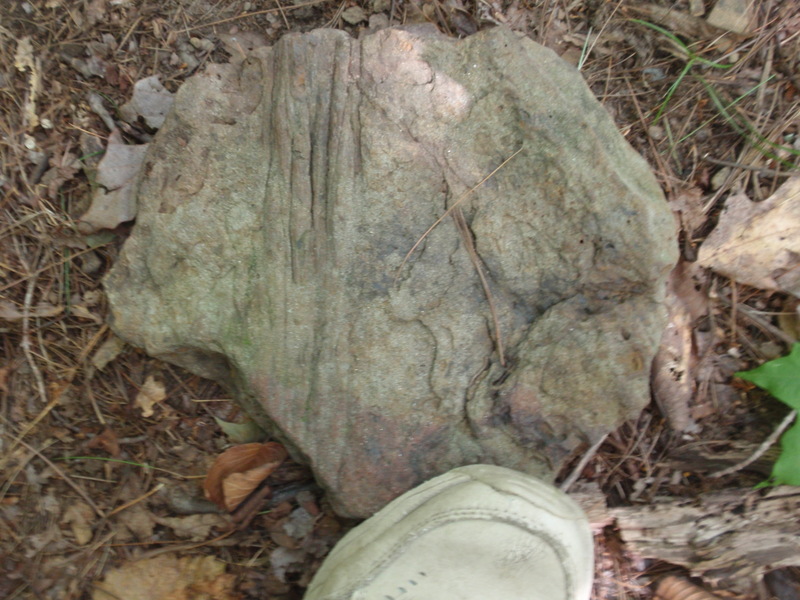 This one is a mold or impression in petrified mud. 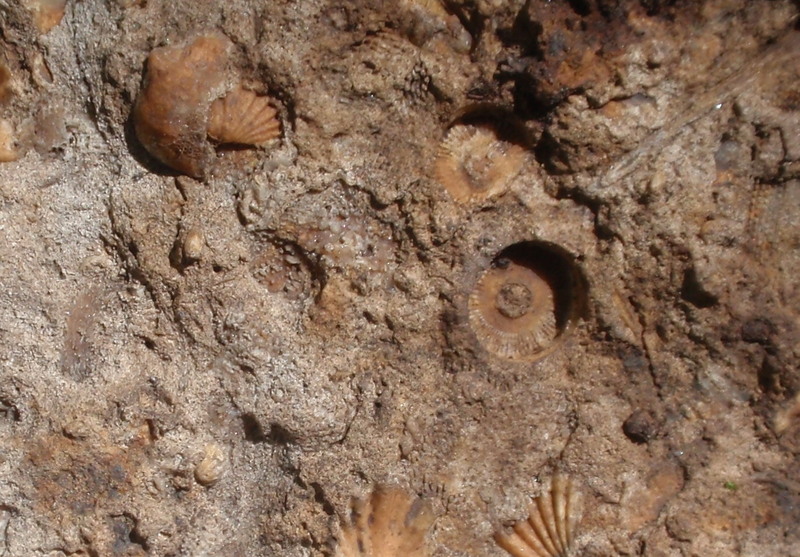 There were also a large variety of fossils in piles up on the ridge (site#3). They appear to be from a wide variety of formations. 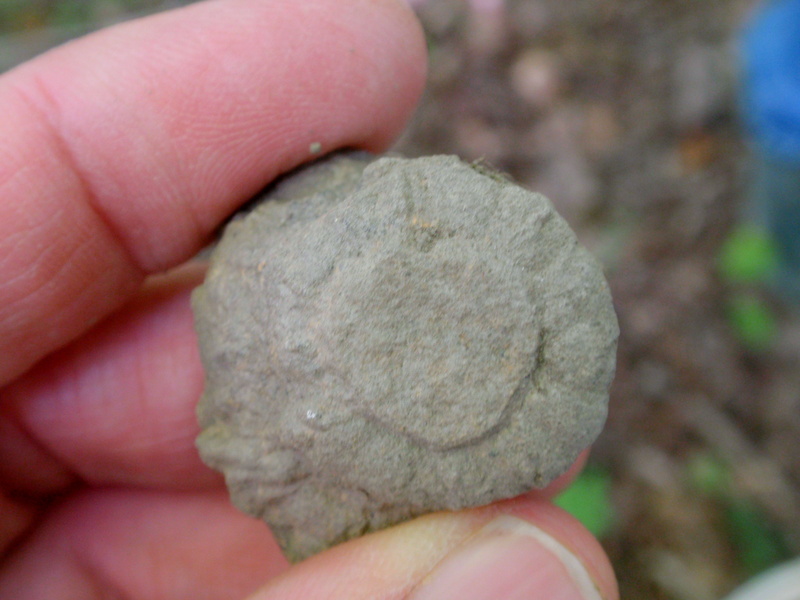 This first one, I (Heimbrock) have seen before in the Bordon Formation of the Mississippian which I’ve confirmed is exposed at the farm. 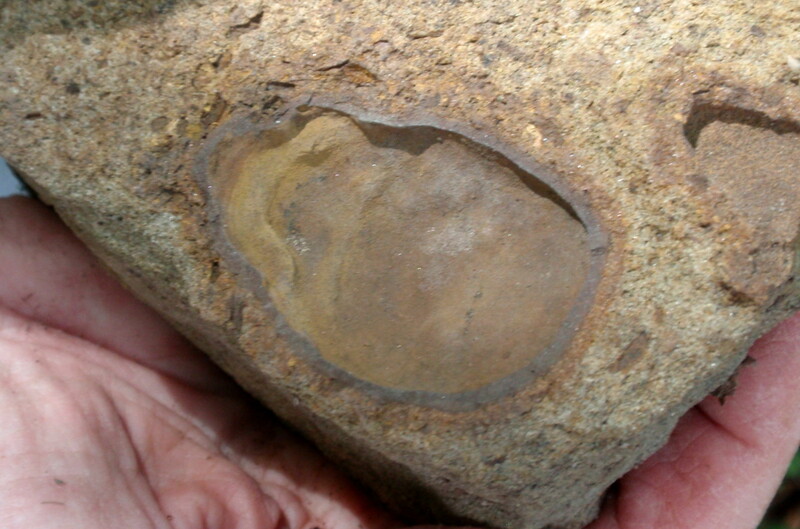 This (below) is a cross-section of a concretion lined with an iron-rich mineral. The interior of the concretion nodule was softer and has dissolved away over the hundreds of millions of years. The tougher mineral exterior has survived to take its shape. 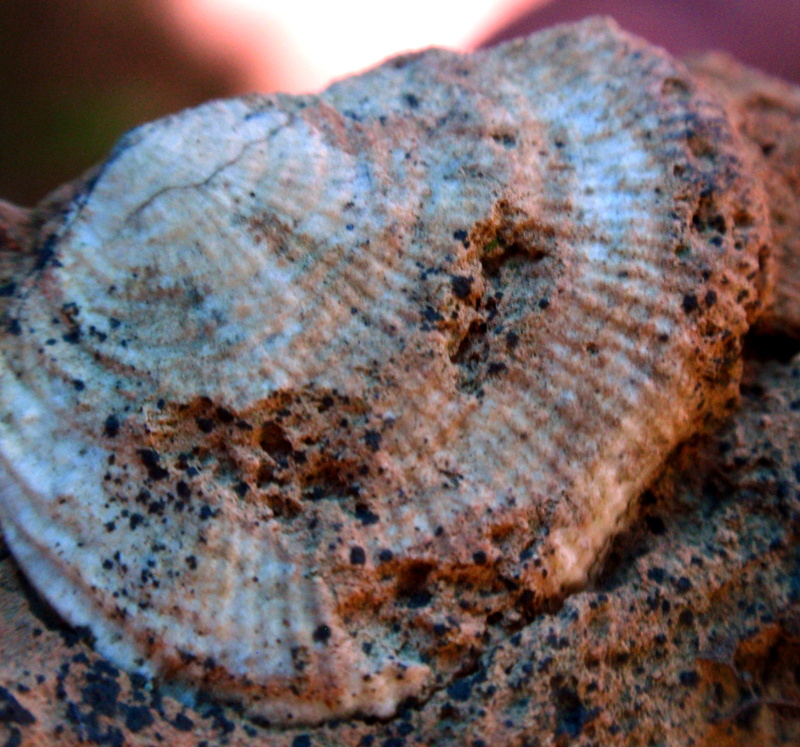 This is not a fossil but might have started with a fossil at its center 330 million years ago. 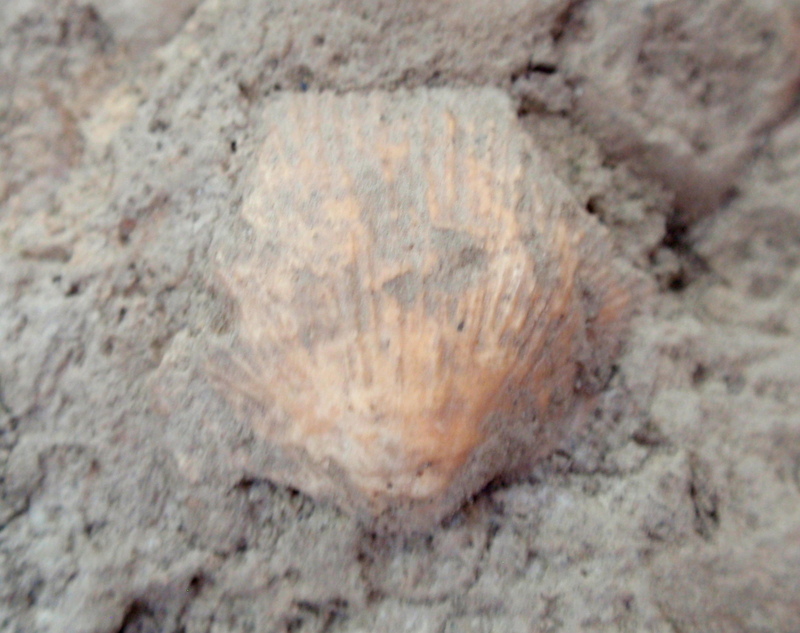 The brachiopods we saw in the piles on the ridge were not in situ (in place) so we have difficulty identifying them. These are either Mississippian or Pennsylvanian in age. (next 2 pictures). Now here’s a GOOD FOSSIL (photo below). What’s good about it is we don’t recognize it at all. This means it could be something very interesting and collectable. 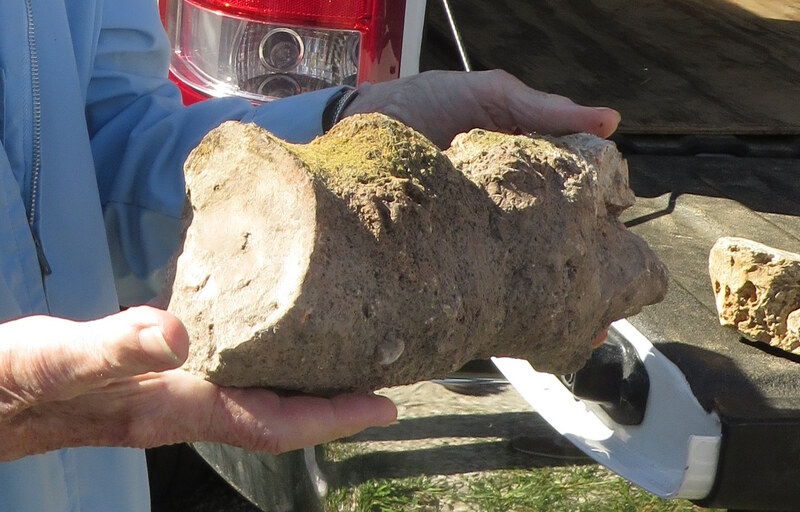 It appears to be a circular form made of shale and is probably a cast. Candidates include plant stem, animal burrow infill, soft bodied animal cast or many other things. Here’s a nice slab found somewhere on the ridge. It’s loaded with crinoid stems, brachiopods, bryozoans, and clams. (next 2 pics). Additionally, we might have a piece of coral on the above slab. Shown below in the next two photos, this closely resembles a colonial coral. It is likely to be Mississippian age. Nice! And finally, what are these cylinders of irregular thickness made of crystalized minerals? We had lots of ideas. NONE of them panned out. Not crystalized horse-tail plant stalks, not cave material from up the stream (Stalagmites or Stalactiites). When you have eliminated all the possibilities, then whatever remains, no matter how unlikely, must be the truth. In this case, we are likely to have animal burrows filled in with minerals and expanded like geodes. In fact, you could call them geodes! That’s all we have about this trip. I hope this brings some light for the property owner as to what the fossils really are on this Greenup County, Kentucky farm. Here are some more photos we all took of the day. 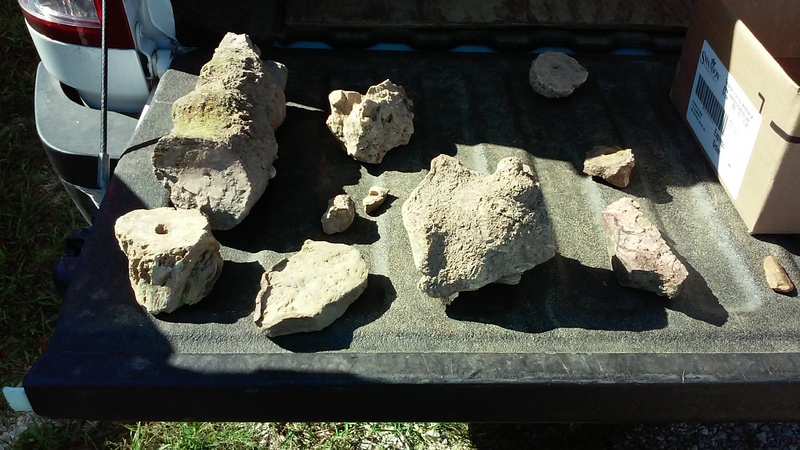 We would like to thank the owner (whose name is withheld to protect his privacy) for his hospitality and allowing us to look around on his property and take home a few fossils. 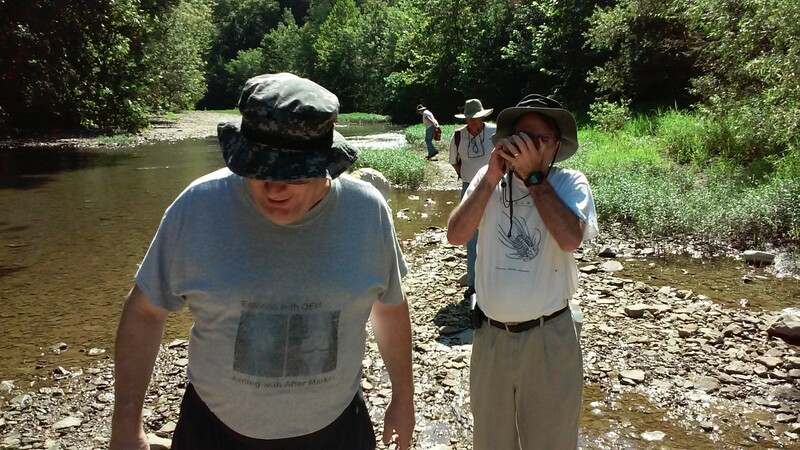 I've been fossil hunting since 1989 and an active member of the Dry Dredgers since 1991. The Dry Dredgers has had the biggest positive influence on my fossil hunting. What I have learned from my fellow members - both amateur and professional, has made a simple recreational hobby become both productive and much more enjoyable. 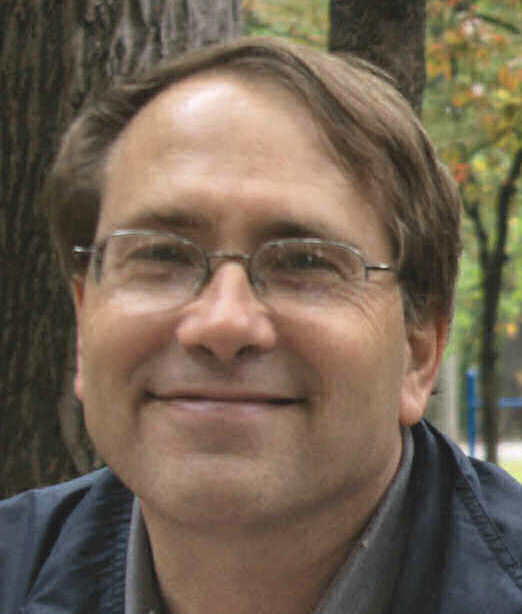 I am the developer of the Dry Dredgers website, drydredgers.org and our Geofair's website, geofair.com. I have been collaborating with professional paleontologists on several projects that have resulted in co-authorships in professional papers. I hope to describe these collaborations and some of my projects in this blog. I’m a cephalopod fan. I vtsiied the Monterey Bay Aquarium when Mason was a little girl. There was a nautilus in one tank and I swear it was trying to talk to my daughter. It would wiggle it’s tentacles to get her attention, get real close to the glass and stare at her with those blue eyes. When Mason would start to leave, it would get all excited and go through the whole routine again until she would come back. They look so intelligent. Makes you wonder. I’d be interested in seeing pics of the fossils. That’s a fun story, Moymoy. Cephalopods today are so intelligent. 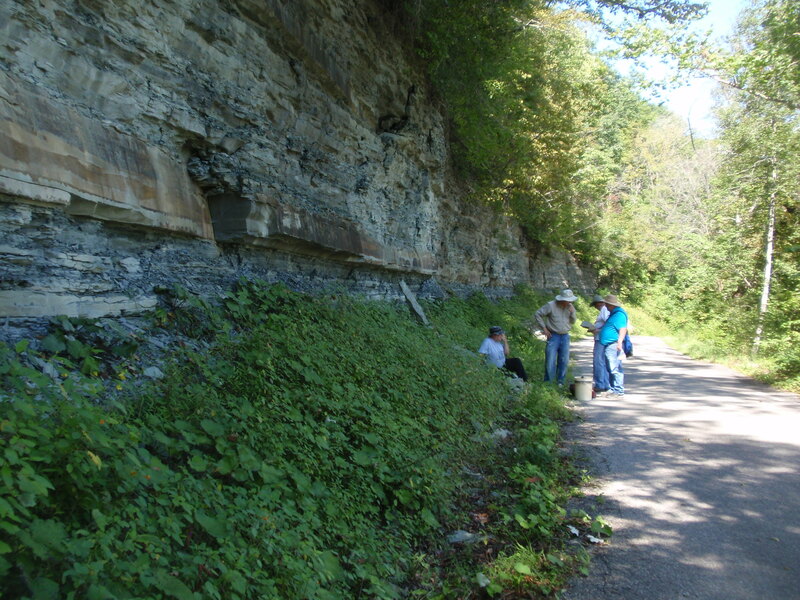 Another great locale for Mississippian fossils, the Big Hill road cut on 421 southeast of Berea, KY.
That really is an awesome site, John. Thanks.